I read recently that there are more shades of white available than of any other colour. Just looking around my house, I can well believe that. My husband's paternal grandmother crocheted this tablecloth, also seen in the above photo. She loved needlework and created many beautiful things, of which I have several. I wrote a tiny bit of Dora's story here. I don't know how old this tablecloth is, but I'm guessing between 40 and 60 years old. For the past 20 years or so, it has adorned a table in my mother-in-law's home. I'm honoured that last summer she gave it to me. Although slightly yellowed with age, the intricate and even stitches have undeniable beauty. One of this year's goals is to improve my photography skills by reading and applying the information in my camera manual. On each photo I've added specifications - the speed, f-stop and ISO. I can see differences in the above photos, but they are minute. So which one is the better photo? My camera is not a full DSLR so my options for control are limited. However, from this experiment, I can see that I have a LOT more to learn about photography. Mary, from the Little Red House, is encouraging people to link up with her theme of the colour white today. Her camera prompt was a good excuse for me to play with some of my whites and to get to know my camera better. It will be fun to see what others come up with. Are you taking votes? I'd vote for the one on the right. That's a very high ISO number. I must try that and see what happens. Tripod or does that go without saying? Yes, I used a tripod. But oops, I forgot to turn off the anti-shake feature. I spent a little time reading the book this morning, and tried something different using the bracketing feature. First I set the F stop, then, using the bracketing feature, the camera took 3 shots, one after the other, and I chose the best ones of the lot. The BKT alters the ISO and speed according to the shot. Kind of a neat feature I'd never tried before. It's hard to decorate with whites because as you say, there are so many variations on the colour. I like the tablecloth and stacked linens. My great aunt made a large crocheted tablecloth and I always thought that it, like yours, it must have involved so many hours of careful work. As for which photo is best, I don't know that I have the eye, but the one on the right looks a bit brighter and seems to highlight the crochet work a little more clearly. But really, they both look lovely to me, Lorie! When you look at a paint catalogue it is amazing how many shades of White there are. Love your shades of white...and the frames around your photos. :) How nice that you now have the heirloom tablecloth! What a good idea to put the info on the photo especially when trying something new. Enjoyed your whites. 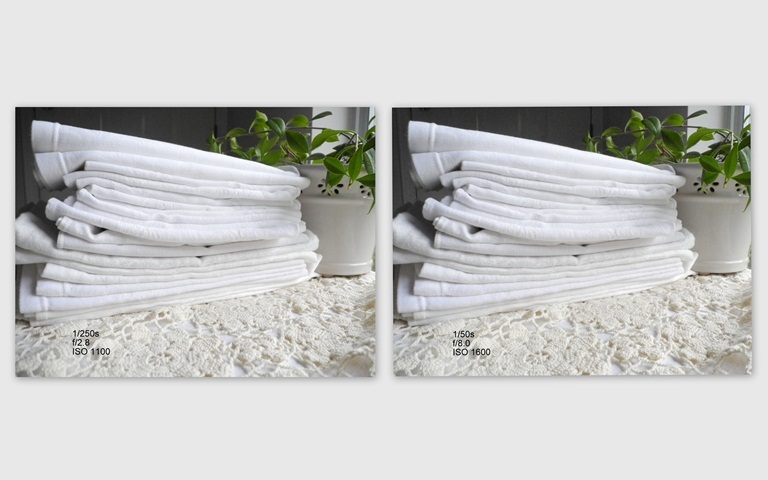 I find the second photo of the towels to be crisper but I guess it depends on the effect you're going for. The first photo "feels" softer and inviting. How fun to experiment this way. I have so much to learn too about my own camera. I prefer the photo on my right...the images are clearer. I suppose, it would depend on what you're trying to capture. I, too, am trying to improve my photography skills!!! The tablecloth is exquisite, dear one!!! Oh Lorrie, how pretty! Your heirloom tablecloth is beautiful. I love the point of view in the first image, and how the cactus leaves echo the shapes in the tablecloth! I really enjoy the various shades of white and I must say that tablecloth is exquisite . . . a true treasure. I am drawn more to the photo on the right though the differences are so very subtle. The tablecloth is gorgeous. Learning the settings of a camera is so fun, enjoy. Such a lovely tablecloth. I admire your photography efforts. It all eludes me. Your photos are beautiful! Beautiful, beautiful tablecloth! I LOVE the color white (in all its variations). That is a beautiful tablecloth...and what a treasure. Family pieces are so special. Family treasures are wonderful to have in our lives...beautiful tablecloth. Lovely treasures. I'm always trying to learn more about my camera settings .. it seems to be a never ending job. Your tablecloth is a treasure! I enjoy whites and think they are comforting even though I don't have a lot of them myself. I simply love tablecloths. I know they are no longer fashionable but I have a small collection which I’ll never take to a charity shop. I even made some of them myself. I only hope my daughter will like them as much as I do and as much as you love your grannie’s cloth.